“Vetra was on the cutting edge of particle physics,” Kohler said. “He was starting to fuse science and religion … showing that they complement each other in most unanticipated ways.” — Dan Brown, Angels and Demons , 38-39. In Dan Brown’s thriller, Angels and Demons , the hero Robert Langdon observes the title of one of the books in Leonardo Vetra’s library: The God Particle . The book actually exists and is in print. It was written by Leon Lederman, a Nobel laureate and particle physicist. What Dr. Lederman calls “The God particle” is the Higgs boson, a subatomic particle that is postulated to exist, but (as of March, 2009) has not yet been detected. This particle has been postulated because, according to current physical theory, its interactions with other particles in the subatomic realm would offer some explanation of the masses of these particles. Finding it would be a spectacular confirmation of what has been called “The Standard Model” for explaining the realm of the smallest particles. Why has the Higgs boson proved so elusive? If it exists, it is probably quite massive as subatomic particles go. The more massive the particle, the more energy it takes to create it, according to Einstein’s famous principle of the equivalence of mass and energy. The energy must be concentrated in a very small area. Particle physicists do this by accelerating particles such as protons to nearly the speed of light. The high speed implies high energy. But the higher the energy, the larger must be the equipment used to impart the energy and to hold the accelerated particles. Part of the CERN site. Below is a photo of the tunnel (a circular tunnel 27 kilometers in circumference) holding the “Large Hadron Collider,” the most massive particle accelerator in existence. Would the discovery of “the God particle” bring us any closer to the discovery of God? Not really. The God particle is merely a particle, not God. It would be an exciting discovery in the highly specialized field of particle physics. But our ordinary world would go on just as it did before. Why then has the Higgs boson been singled out and given its exalted name, “the God particle”? Physicists would like to get “to the bottom” in understanding the physical character of the smallest particles, and the Higgs boson would in one sense be a temporary bottom. (I say “temporary” because many physicists think that still more remains to be revealed at even higher energies.) Getting to the bottom gives scientists the feeling that they have achieved a God-like knowledge. So it is not completely arbitrary to have given the Higgs boson its whimsical alternate name. Albert Einstein is reported to have said that his career in physics was an effort to “know the mind of God.” Einstein was not a Christian believer, but his statement is not a facetious statement. If physicists discovered the Higgs boson, they would have confirmed at a deep level the understanding of the world that they call “the Standard Model” for subatomic particles. That understanding would then reflect the very nature of the world as created and sustained by God. Joel Achenbach, “At the Heart of All Matter: The Hunt for the God Particle,” National Geographic https://ngm.nationalgeographic.com/2008/03/god-particle/achenbach-text, accessed Mar. 4, 2009. 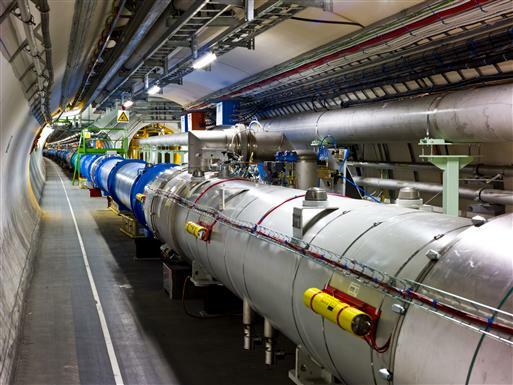 CERN, The European Organization for Nuclear Research, https://public.web.cern.ch/public/.